Signed and dated lower right: "Bill Scott 15"
Signed and dated lower right: "Bill Scott / 14"
Hollis Taggart Galleries presents an exhibition of Bill Scott’s recent paintings, Bill Scott: Imagining Spring, opening on March 10, 2016, with a reception from 6:00 to 8:00 p.m. In addition to large-scale paintings, the show will also include four examples of the artist’s prints. Scott, born in 1956, lives and works in his native Philadelphia. Imagining Spring is Scott’s sixth exhibition at Hollis Taggart and his first in three years. These new paintings bear ample traces of the singular approach to medium and color that has marked his productions over the past two decades, but at the same time they signal a new individuality in his art. Comprised of 24 paintings, there is a wide variety, from low and wide landscape orientated works to a new tondo format. All bear Scott’s characteristically coloristic approach, with activated surfaces formed of interweaving related tones in broad washes, scumbles, and glazes. The artist paints using brushes, knives, and in frottage techniques that expand the textural range of the laid pigments, resulting in remarkable surfaces comprised of shimmering planes of radiant color. Despite the considerable amount of visible gesture, the canvases are without impasto. The expressive energy that Scott achieves in the absence of relief is a remarkable testament to years spent honing his technique. Late October (2015), Bird’s Nest (2015), and Lovely Weather (2015) represent Scott at his most richly individualized, confident in manner and execution in pictures that despite their cacophony of swirls, lines, slashes, overlaid forms, tones, and compositional variety from inch to inch, feel fully resolved. The relationship between the grand oil painting titled Imagining Spring (2014) and its similarly titled print (2015) sheds a fascinating light on Scott’s artistic process. A Month in the Fall (2015) is Scott at his most frenetic and active, and while the forms threaten to befuddle and elicit a state of unmanaged chaos, the superbly controlled colors, their harmonized tones, and their frequent recurrence across the canvas give the picture a stability within complexity. It is a painting that shows Scott at his more daring, new, and original. On the cusp of turning 60, these bold works reveal how Scott has advanced his distinctive vision. Bill Scott began his career working informally with Jane Piper and Joan Mitchell and in studies at the Pennsylvania Academy of the Fine Arts. He has consistently channeled traditions of art in his work, acknowledging the impact of the collections of the Philadelphia Museum of Art and the Barnes Foundation, and in particular the pictures of Pierre-Auguste Renoir and Berthe Morisot. 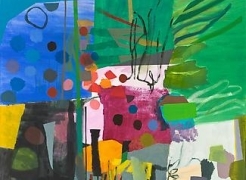 He has exhibited widely over the past thirty years at museum venues including Swarthmore College, Hollins University, the State Museum of Pennsylvania, the National Academy Museum, and the University of Delaware. Scott’s work is found in public collections throughout the United States, including the Delaware Art Museum, the Pennsylvania Academy of the Fine Arts, the Cleveland Museum of Art, the Philadelphia Museum of Art, the Butler Institute of American Art, the Munson- Williams-Proctor Institute Museum of Art, and the Woodmere Art Museum. The exhibition is accompanied by a catalogue with an essay by Jason Rosenfeld, Ph.D., Distinguished Chair and Professor of Art History at Marymount Manhattan College, author of John Everett Millais (2012), co-curator of River Crossings at Olana and Cedar Grove in Hudson and Catskill, New York (2015), Pre-Raphaelites: Victorian Avant-Garde at Tate Britain, the National Gallery in Washington, D.C., and the Pushkin (2012-14), and John Everett Millais at Tate Britain and the Van Gogh Museum (2007-2008). He has also published on Marcel Dzama, Stephen Hannock, and Lionel Smit.